Here are answers to some common questions we have been asked about us or the services we provide. To go to a particular section of interest, click on the links below for quick access. Have a question and you can’t find the answer here? Email us and we’ll get right back to you! Absolutely! Confidentiality and discretion is as important to us as it is to you. We know that working with you in your home requires sensitivity and trust and we provide that to every client. From time to time, we may want to share client stories, quotes or referrals, but we will always ask, explain how we’d like to use it, and get permission first. Our initial consultation to review the full scope of your needs and provide you with an action plan and estimate is always absolutely free. If additional consultation is desired, then standard hourly rates will apply. What if I just want to pick your brains? We love to share our knowledge with clients and think you’ll find our complimentary initial consultation very informative. If you seek our expertise on an ongoing basis we will charge an hourly rate in line with the guidance being provided. We work with clients to fit their budget, and will openly discuss your options, the pros and cons and costs associated with each. We charge hourly rates that vary according to the work being done and number of team members required to complete it. Our quote will also include the cost of any materials required to get the job done, such as moving boxes and paper. You can hire us for a particular service, multiple services or a whole project. Often our fees can be included in the closing cost of the home if it is being sold, or paid directly by an estate attorney if applicable. When we agree on an action plan and quote, you and Chaos to Calm will sign a contract that outlines the budget and the work to be done. Our goal is to give you peace of mind and to prevent any surprises. We know that our services may appear expensive, but once clients compare the cost of their own or their family’s time multiplied by the length of time it will take to complete a move or other project, they agree that we usually save them money in the long run. Yes! We are proud to present references from a variety of clients, as well as other professionals we have partnered with who love what we do. Are you licensed/bonded/insured and why is it important? Yes, Chaos to Calm is licensed, bonded and fully insured and we are happy to provide documentation of our coverage. This is important for your protection and ours. Our team members are all employees have each passed comprehensive background checks, so you can feel confident about having them in your home. We have worked with clients in Mecklenburg, Cabarrus, Rowan, Iredell and Union counties in North Carolina, and York and Lancaster counties in South Carolina. However, we are also happy to travel to assist with moves to or from our area. We recently spent a week in Delaware packing a large household for a move to North Carolina. We love field trips! Our services, especially decluttering and organizing, make an excellent gift for someone you love. We offer certificates for a quick Two-Hour Tidy, open-ended accounts or for a pre-set amount of time based on an hourly rate. How are you different from moving companies? Our team has a passion for this work and will make sure your experience is one you’ll rave about! 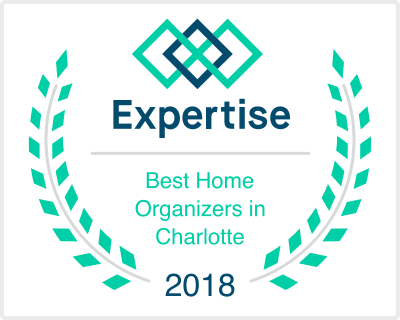 We lay the groundwork for an easy and successful move by helping you with floor planning, decluttering, purging and organizing. You will arrive at your new home with only what you love and need, and you won’t spend unnecessary funds moving things you don’t. We work at your pace and on your schedule. We completely unpack every box, put every item away and remove the boxes, paper and any rubbish. We also set up your kitchen, organize the closets, make the beds and hang the pictures. We leave you ready to enjoy your new home to its fullest. Will I still need to hire a moving company? Chaos to Calm is not a moving company however we will help you choose the correct moving company for the project and will work with and supervise that company to ensure the move is performed as efficiently and quickly as possible. When should we call you for help with our move? The earlier the better, especially if you plan to simplify or are downsizing so we can tackle that project first. However, we are nimble and experienced and can successfully manage a move with an ambitious timeline, especially if it means a better experience for your family. Do you pack electronics and set them back up? I don’t want to be without my computer for very long! We pack, unpack and set up small electronic devices and countertop kitchen appliances, including simple home computer systems. Large electronics or anything that requires any type of electrical wiring (large TV’s, speaker systems, etc…), appliances and extensive electronic systems are left to the professionals we partner with to manage your move. If we feel your system is too complex for us to set-up we will discuss it with you upfront and create a solution. Will you perform personal errands during a move? We are happy to take care of personal shopping for items such as shower curtains and picture frames, whatever is needed to make your new home move-in ready. We also handle errands such as address changes and new utility set-up. Our goal is to make your move a pleasure and taking care of the extras is part of what makes us extraordinary! Can you help with pets during a move? Yes, that’s another reason we are an ideal choice. We understand that your pets are part of the family and need as much consideration and care during the relocation process as you do. We have resources within our network to make sure the move is comfortable and stress-free for them as well. What do you do with all of the stuff I don’t need or want anymore? We will either help you donate your items to a worthy charity, or link you to the best resource for selling. We can recommend auctioneers or consignment stores, whichever is most appropriate for the type of items you are letting go. Our team has a variety of expertise to offer in evaluating antiques, collectibles and vintage items and will always make the best recommendation for you. It is important for you to know that Chaos to Calm never benefits from facilitating any sale of your items. Who makes the final decision as to what is donated, sold, kept or disposed of? Who gets the tax benefit when you donate my items? You will receive the tax benefit from any donated items. We will provide you with a receipt from the benefiting charitable organization and documentation of the items you donated for your records. Will you manage the delivery of items I’d like to gift to my children or other loved ones? We’d be happy to perform this service. Simply provide their addresses after the items have been designated, and we will professionally pack and ship them for you. What do you do with personal records/paperwork that I don’t need anymore? We always maintain strict confidentiality and security when handling financial paperwork. We will either bring papers to the confidential Shred-It bin in our office, or coordinate with a shredding service if the amount is extensive. A CSMM is Certified Senior Move Manager, an accreditation earned after the completion of a rigorous course of training offered by the National Association of Senior Move Managers (NASMM). Do you have experience working with dementia and other age-related concerns? Yes, we each have personal and professional experience dealing with the cognitive, physical and emotional issues that are so often part of aging. Can I hire you on behalf of an impaired family member if I do not have a Power of Attorney? We can only work for either the owner of the items or the person who has Power of Attorney for the owner. Is it possible to stay where I am and not move into an adult community/assisted living facility yet? Safety, comfort and quality of life are all important considerations when determining whether your current residence is serving your needs best. Often, simple modifications can be made to adapt a home to make it work for different needs. We will walk through and help you and your family identify issues and provide our thoughts regarding the feasibility of staying in your current home.